I don’t know about you all, but I’m ready to get this weekend started. After a week of working overtime on all of our current projects (i.e. wedding planning, remodeling Barclay’s house, taxes, car stuff, and — you know — work-work), my calendar for the weekend ahead looks refreshingly chill. Lots of good downtime to recharge my introverted batteries. A few hangs with some of my favorite people. And to top things off, the forecast says the entire weekend is supposed to be sunny…and in the seventies! Well, I hope that your weekend ahead is a lovely and restorative one as well. 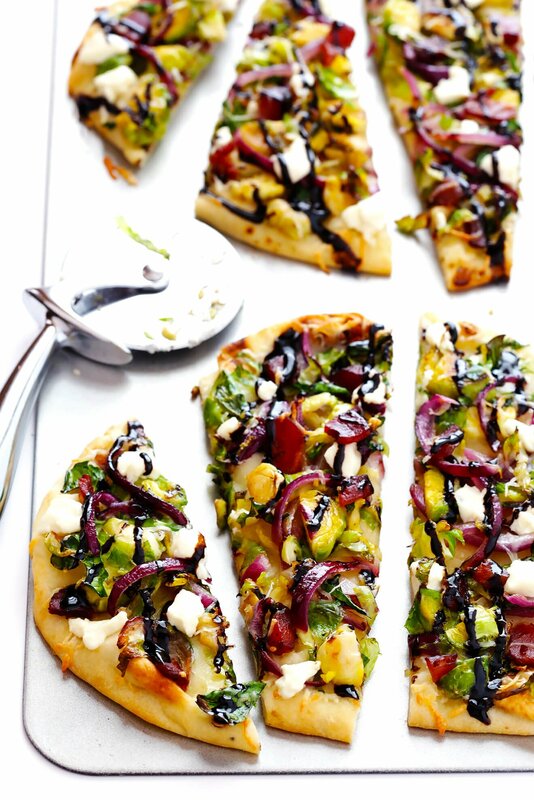 And if you happen to be looking for a delicious dinner or appetizer recipe to make that’s easy, breezy, and speedy to prepare, I can’t recommend this delicious flatbread enough. What’s not to love?! ? But, alas, I landed on bacon and Brussels sprouts. Because…I ? alliteration. And because they’re so dang good. They’re so dang easy to prepare. Then while the bacon is frying, thinly slice your Brussels sprouts, red onion, and garlic. Then give them a quick sauté in the leftover bacon grease until they’re mostly softened. Then brush your flatbread (or pita, or partially-baked pizza dough) with olive oil, sprinkle with Mozzarella (and a little Parmesan, if you’d like), spread the Brussels mixture over the top, add on some crumbled goat (or blue, or feta) cheese. …and voila. 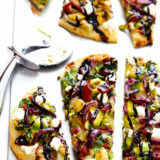 This ultra-flavorful, ultra-simple, and ultra-delicious flatbread will be yours to share and enjoy. Perfect for the weekend. ? Let’s all make it a good one! This Brussels Sprouts and Bacon Flatbread Pizza recipe is quick and easy to make, and packed with bold flavors that everyone will love! Fry bacon in a large saute pan over medium-high heat until cooked. Transfer bacon to a separate plate with a slotted spoon, and set aside. Meanwhile, keep about 1 tablespoon of the remaining bacon grease in the saute pan (you can discard the extra if there’s too much grease in there). 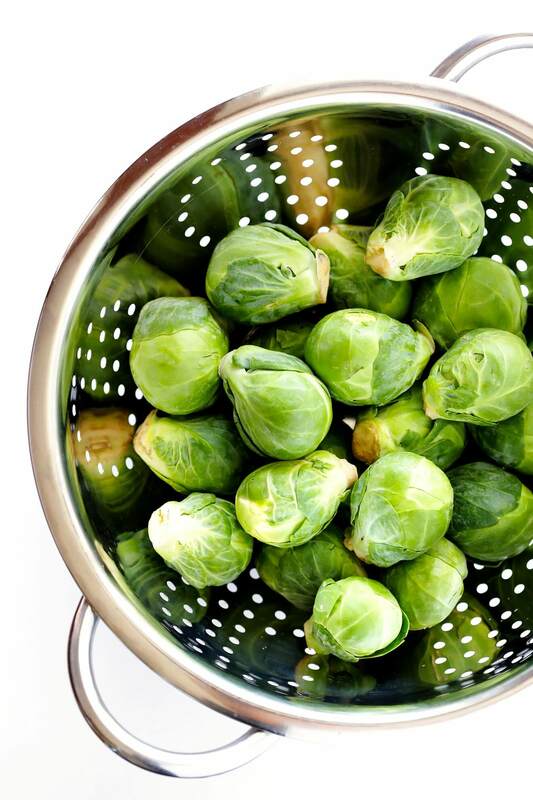 Stir in the Brussels sprouts, red onion, and sliced garlic. 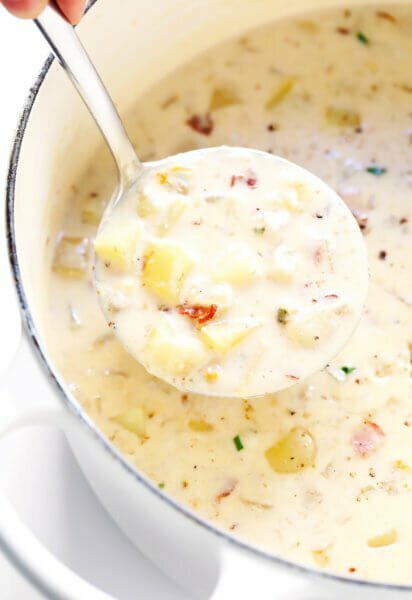 Saute for 4-5 minutes, stirring frequently, until the mixture is softened and the garlic is fragrant. Remove from the heat and set aside. 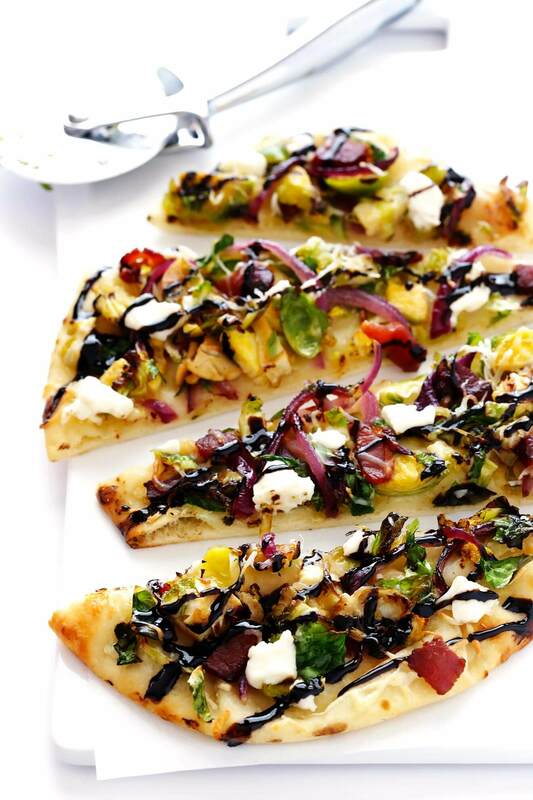 Place the two pieces of flatbread on a large baking sheet, and brush the tops of each with olive oil. Sprinkle each piece of flatbread evenly with about 1/3 cup Mozzarella cheese, leaving a 1/2-inch border around the edges of the flatbread. Then divide the Brussels mixture, bacon and crumbled cheese evenly between the two pieces of flatbread, and spread them out evenly. Sprinkle with the remaining Mozzarella cheese. Bake for 8-10 minutes, or until the Mozzarella has melted and the crusts are slightly golden. 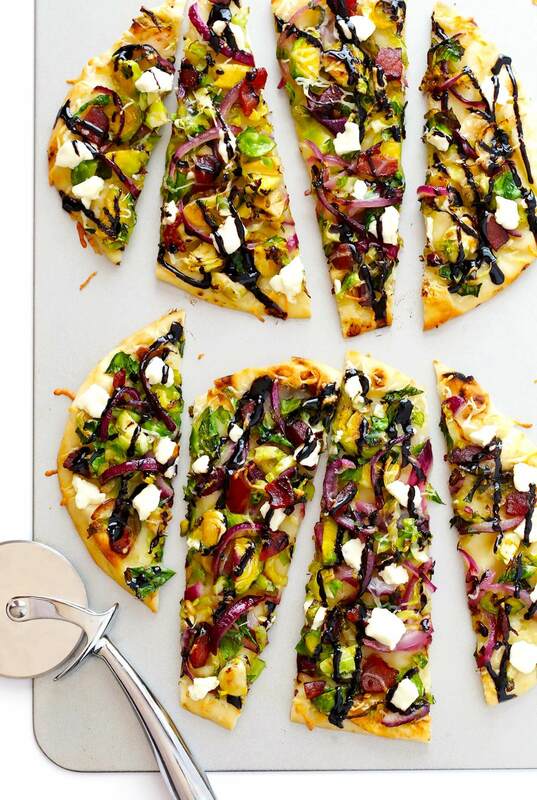 Remove from the oven and drizzle with the balsamic glaze. Serve immediately. 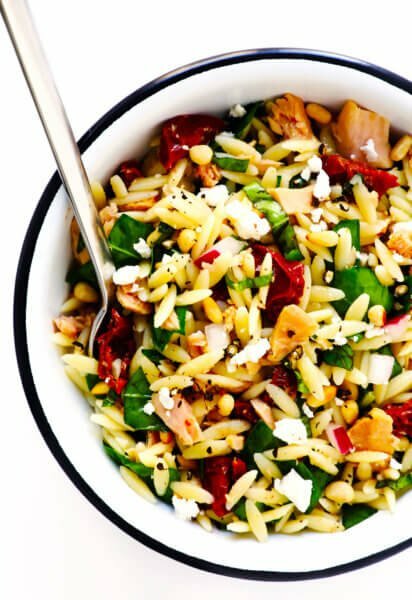 *You’re welcome to use store-bought balsamic glaze. (I love this one from DeLallo.) Or you can simply place 1/2 cup of balsamic vinegar in a small saucepan and let it simmer on the stove over medium-heat until it has reduced by half and is nice and thick and syrupy. Delish! Perfect for brunch, looks so colourful and delicious!! I love bacon! I’ll try this recipe. Thank you, Tanya — we hope you love it! Yes, it’s SO good, right?! And oooh, lucky you, we’re jealous! This sounds like it’s definitely worth trying. It’s definitely simpler to not have to make your own pizza dough, though I do it all the time. 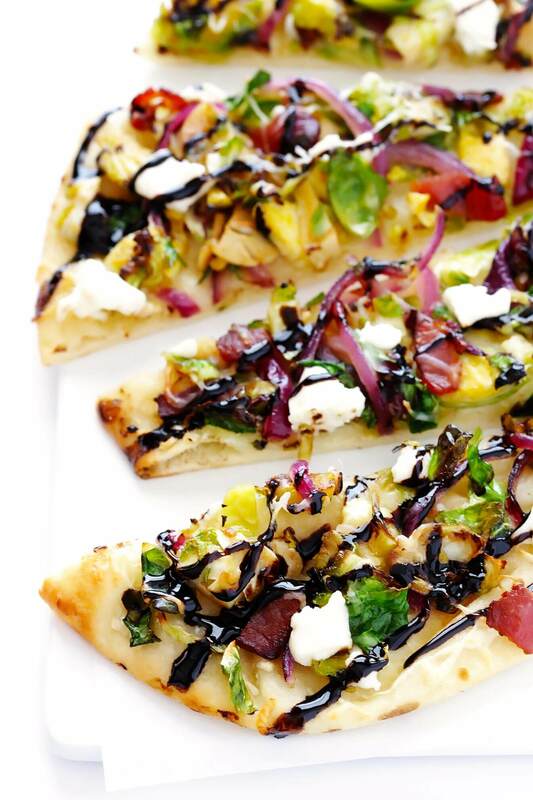 This flatbread is full of my favorite flavors, too. I envy you having a Trader Joe’s nearby: the one we get to go to is about 550 miles away (we get to go when we visit the kids/grandkids in San Antonio); the one in Albuquerque is closer, but we have no reason to go that direction. I hope you do have a nice, restorative weekend. Ours will be if we can survive it. We’re guiding tours at our local state park both days this weekend, and they are the longest tour, which is about 4 miles, possibly more. And they involve climbing up rocks to show our groups the ancient pictographs we’re going out to look at. That park is my favorite place to go for restoration. I made this last night and thought it was delicious! We’re so happy you enjoyed it, Jenny! Thanks – that was great! I’ll make extra “toppings” next time so there will be leftovers for a pita sandwich in next-day’s lunch. We’re go glad you enjoyed the recipe, Melissa! This is probably one the BEST dang things I’ve ever eaten! Honestly! I’ve made it twice now and both times my company and I were blown away by how tasty it was. I’ve made it exactly as listed using goat cheese and I honestly can’t fault it. The earthiness of the brussel sprouts paired with the saltiness of the bacon, the creaminess of the goat cheese and the sweetness from the balsamic glaze LORD so good. 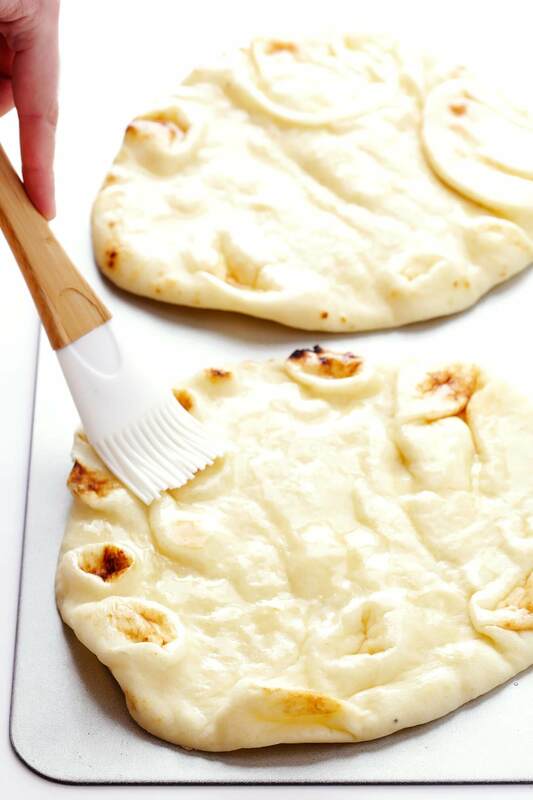 I used traditional flatbread the first time and naan bread the second time and I definitely prefer the flavour and texture of the naan bread with this recipe. 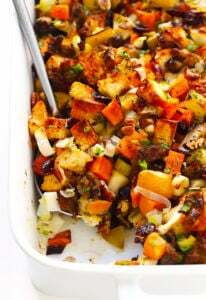 I also used a little more brussel sprouts than listed so my breads were more hearty. It is a little fussy to prepare in my opinion but totally worth it. 5 stars!!! !